Time was there’d be no way a new song and album by Bruce Springsteen could possibly get released without huge fanfare. Hell, I can remember when “The River” came out: the two rival rock n’ roll radio stations in Cleveland bickered and fought so badly over who would get to premiere it first, Columbia Records gave one station Record One and the other station Record Two the first day, and on the second “premiere day” each station got the other disc in the two record set. 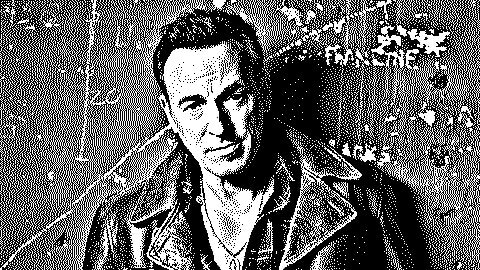 Tonight I happened to notice in the small print on iTunes that Bruce and the E. Street Band are getting ready to take the show on the road again (Washington, DC on November 11) — the first time in five years —to support a new album called Magic. The small print. On iTunes. Sheesh. Maybe this is yesterday’s news to people who listen to satellite radio (although I know a lot of people who like Bruce and do subscribe, and none of them has excitedly mentioned anything about this) and read Rolling Stone, but so what? What happened to “sneak previews” at midnight or listening to your favorite DJ ramble on while he eagerly awaited a special delivery “white label - radio station only” edition to be dropped off by Fed-Ex, or competing stations fighting over who would be the first to put the needle down on the prized piece of vinyl? It’s nowhere. Today’s Happy Medium Song of the Day is the “world premiere” of “Radio Nowhere” by Bruce Springsteen and the E. Street Band. You can find it on the album Magic — due out in early October and available in stores… um, somewhere.